The NextMed Center of Carlsbad is a medical campus hub for innovative medical treatments focused on defining the future of medicine. Women’s services, regenerative medicine and orthopedic surgery. Rooted In Place was the lead landscape architect, working with BSD Builders to develop a water-efficient landscape, that complemented the older, sister medical complex adjacent to the NextMed Center. Rooted In Place incorporated some of the existing healthy and thriving trees, groundcovers and shrubs into the overall design, while also adding natives to cohere with the sensitive habitat that lay to the south of the NextMed Center. 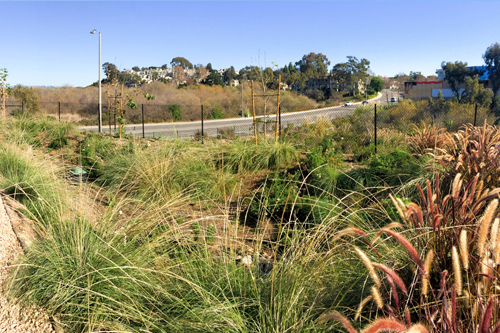 Rooted worked with Helix Environmental Planning to create the native plant palette and planting layout for the slope restoration on the City of Carlsbad land adjacent to the NextMed Center within the Habitat Management Plan. The NextMed site was designed to capture stormwater by including permeable paving, a bioretention basin and curb cuts throughout the parking lot planters. Rooted In Place guided the process from concept design through construction administration to ensure the continued collaboration and communication were strongly facilitated.